I purchased and downloaded Graswald today and it is working excellently on Blender 2.79, however when I try to download it on 2.8 I get this error. I have the latest version of Blender 2.8 (I redownloaded it today), so I don’t believe that is the issue. Any ideas of what the issue might be? Graswald version 28_01b is known to be broken. Version 28_01c should be working fine, but I’m not sure if Julius has had a chance to upload it yet. Thanks for your thorough reply. My post was mostly to see if reporting bugs this way works, and I’m glad to see it does. So I’ll elaborate. I figured this out: undo history. I set an undo memory limit, which solved the problem. As to the magnitude of “leaking”, adding a system would use 200 MB of memory, and removing it would use another 200 MB, which added up fast when experimenting. I haven’t been able to repeatably produce this problem. However, if I select “Link to Scene” and then inspect the material of an object that draws as black, it looks as in the attached screenshot. If I change to eg. “low” material detail, the material looks fine. Is there some way I could debug this further? I can send you the .blend file if that would help. By “translation” I just meant the texts that show in the UI. The first problem I noticed was the apparently unevaluated reference as seen in the attached variant-desc.png. Then let’s look at the “Use shared mat” control as an example. Searching for “shared mat” finds nothing from the manual, because the text talks about “Unique vs Linked Material”, not about “shared” materials. The small “using linked mat” image seems outdated, as the control now says “link to scene”. The very first screenshot in the manual is from yet another version of the add-on, I assume. This kind of things make the manual difficult to use and understand. Thanks Kareem! Once Version 28_01c is available will it be posted here or should I look for it somewhere else? I’m currently able to repeat problem 2 for a brand new Creeping bentgrass system on medium detail level by simply saving the file. That turns the material black. When I then move mouse pointer over the detail level selector, all the material controls below the basic/advanced control disappear. The problem can be temporarily fixed by selecting low detail level, saving, and switching the detail level back to medium. If I then save, the problem is back. The problem is not happening for the low detail level, but it has in the past. Thanks for the updated version! It now installs correctly. Now my issue is that when I click on the + button I get an error message, and Blender can’t seem to find any of the plant models. Any idea why this would be? I ended up restarting and trying again, and this time everything seems to be working well! I’ve also noticed that the objects with Grasswald systems on them keep accumulating particle systems that don’t show in Graswald UI, as well as empty material slots. All of this might be somehow related to the fact that I’ve been duplicating the objects with Graswald systems. Renaming the object with a Graswald system on it seems to be a good way to make Graswald lose track of the particle system, which will then result in weirdness. 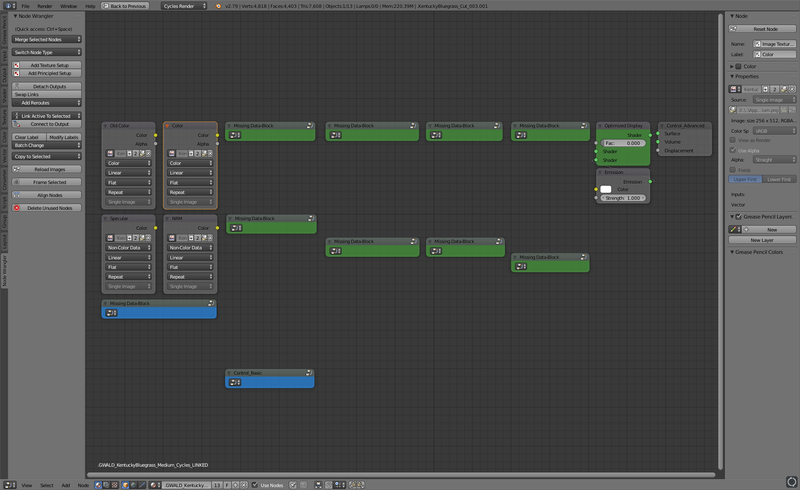 And that of course happens when duplicating objects. It would be nice if Graswald were smarter in those situations. 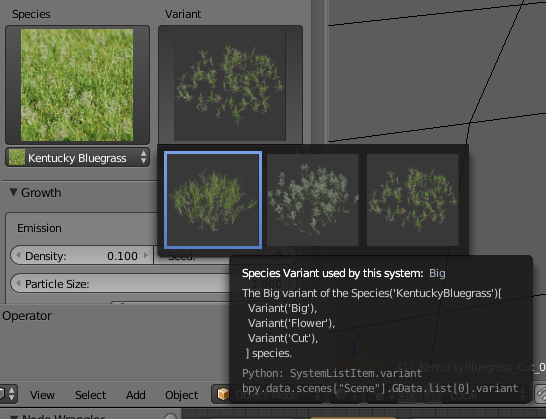 Does Graswald rely the particle system having a name generated from the grass species and variant? I’ll definitely look into this issue. Saving seems to be what triggers possibly all of these problems. Today I’ve not had any problems until I save, at which point often all or at least amost of the systems start immediately showing black (or transparent for high detail systems). Needless to say this is making Graswald nearly unusable for me. Given that using the latest version 1.15 is a pretty frustrating experience, can I download the previous version somewhere? In general it’s nice to be able to install also earlier versions of software. I’m not sure, Julius typically manages all the uploads. But you’ve given a lot of details, so I should hopefully be able to resolve all the issues in short time. If you don’t… issues may arise. I need a better way to deal with duplication… but that will also break backwards compatibility. Do these errors still show themselves if you don’t mess around with duplicating objects? Just add the # as shown. Then tell me if this fixes the issue. If it does, that really narrows down our search. Just letting people know we got this bug figured out and it should be fixed in the next version 1.16. Very frustrating. Bought this months ago, haven’t been able to use it since. Latest version, Graswald_28_01c, does not install, can’t read code text - is off screen left.